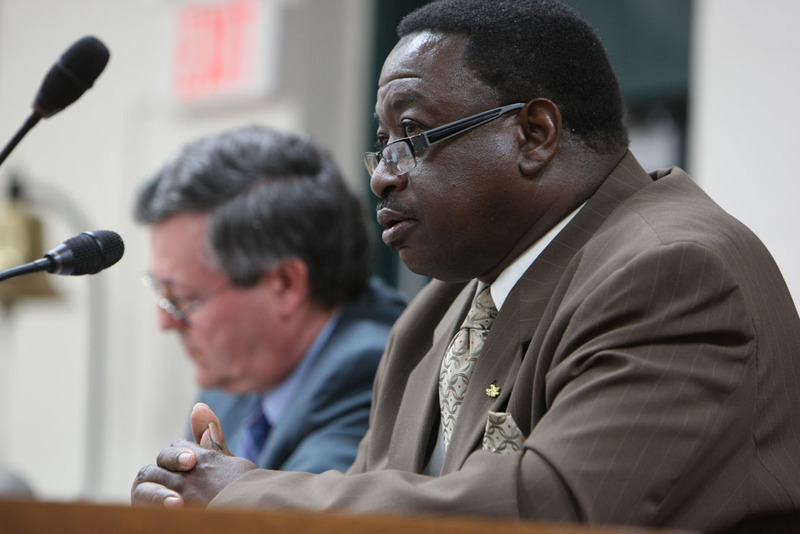 Dave Selmon says there is no right way to do wrong. Republican Dave Selmon (right) then a state House candidate, answers a question during a Burlington Business and Professional Women’s candidate forum, on Oct. 19, 2010, in the Thomas J. Smith Council Chambers at Burlington City Hall. He didn’t always think that way. In the early 1990s Selmon was into selling and using drugs. He served time and is clean now, working on a college degree, tending to a Burlington church as its pastor and going into jails to minister to the inmates. In those jails, the percentage of black men exceeds that of the black population outside. A disproportionate involvement with the criminal justice system is tearing black families apart and preventing them from finding good jobs, social workers, minorities, government officials and community leaders said in interviews over the past four months for a special project on opportunity disparity in Iowa. The numbers get reported from time to time. 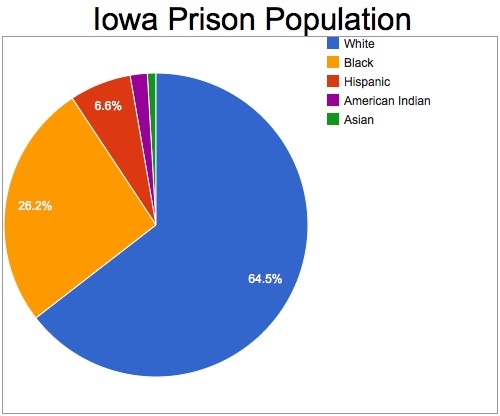 The most recent annual reports from the Iowa Department of Corrections, for example, show the percentage of African American offenders in the corrections system grew from 15.6 to 17.4 in the years 2008-12 while the percentage of white offenders dropped slightly from 76.6 to 74.5. 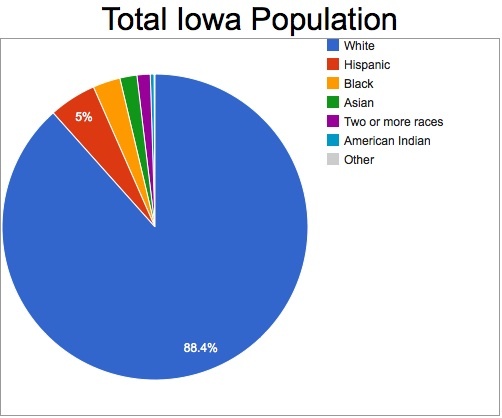 U.S. Census Bureau data show that only 3.2 percent of Iowa’s population was African American as of 2012, the most recent estimate available. Reasons for the disparity vary. Prominent ones in interviews for the special project, called Iowa’s Opportunity Gap, were a disproportionate amount of police attention given to black neighborhoods, which means more opportunity to be caught doing something illegal, and racial presumptions – profiling – that lead police to question a black person more so than a white person. But other reasons exist, too, including living in unstable homes, having fewer resources to fight a criminal charge and not knowing your rights. Plus, people make bad decisions. “Out of fear sometimes people just give in to the search, or maybe they don’t think they’ve really done anything wrong,” Dedric Doolin, an NAACP board member and clinical director for the Area Substance Abuse Council in Cedar Rapids, said about black people stopped by police who want to check their clothing, car or other belongings. The comments emerged as the nonprofit news organization IowaWatch examined racial achievement inequality in the Iowa’s Opportunity Gap project. The project is a collaboration with The Hawk Eye in Burlington, The Gazette in Cedar Rapids and Iowa City, the Fort Dodge Messenger and the West Liberty Index, using 50 years of census data compiled and made available by the Colorado-based nonprofit news organization, I-News. The census data did not include information about crime, yet crime came up in many of more than two dozen interviews during the project. Adding to that, an American Civil Liberties Union (ACLU) report issued in June raised questions when calling a disparity between whites and African Americans in Iowa for marijuana-related arrests the nation’s worst. The ACLU report found that, despite nearly equal use of the illegal drug, African Americans in Iowa are more than eight times as likely as whites to be arrested for marijuana possession. At the national level the rate of arrest is 3.7 times as likely for African Americans. Veronica Fowler, the ACLU of Iowa communications director, said the numbers are disturbing but that her organization is lacking when determining the cause. “The report probably raises as many questions as it answers: What creates these big disparities? What kinds of things do we need to be doing differently? What kinds of things do we need to be more aware of?” Fowler said. ACLU of Iowa Executive Director Ben Stone said leaders at the organizations hope to map where racial profiling happens, and when. Doolin, in Cedar Rapids, said racial profiling becomes a larger problem in Iowa when perceptions prompt police to disproportionately target black people. “There’s a perception out there that more people of color, particularly African Americans, are more likely to do drugs, to sell drugs, and that’s not a factual perception,” Doolin said. 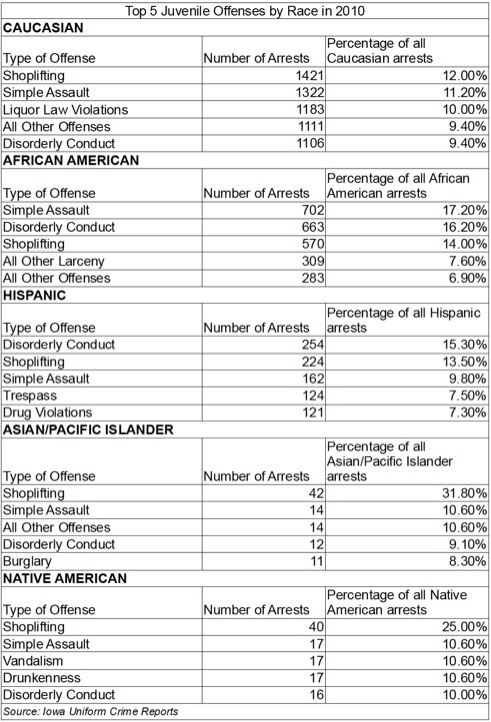 The ACLU report on marijuana arrests does not include data on Latinos. But police also profile Latinos, said Vanessa Marcano, Latino community organizer for Iowa Citizens for Community Improvement. The suspicion usually is tied to whether or not a Latino is in the United States with legal documentation. But it goes beyond undocumented workers driving without a license who are caught by law enforcement officers checking license plate information for owners and licensed drivers, Marcano said. The Polk County Sheriff’s Office has met with Latinos to discuss some of the complaints, which also dealt at one time with the since-discontinued practice of taking fingerprints of Latinos stopped for minor crimes such as traffic stops. 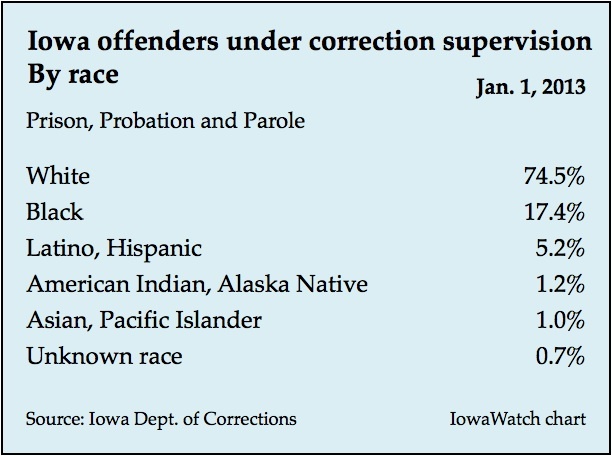 Iowa was the first U.S. state to require minority impact statements from its prison system. The Correctional and Minority Impact Statements report that the Legislative Services Agency filed with the Iowa Legislature at the end of April notes that Iowa ranked first in the nation for over-incarcerating minority men. A recently published report by the University of Wisconsin – Milwaukee about racial disparity in Wisconsin’s criminal justice system ranked Iowa third, behind Wisconsin and Oklahoma and above Pennsylvania. Contact with the criminal justice system starts at a young age for some black Iowans, Jerald Brantley, founder and CEO of Spectrum Resources in Des Moines, said. He offers services that help ex-offenders re-enter society by educating them and providing job training. Data from the Department of Human Rights Division of Criminal and Juvenile Justice Planning show simple assault was the most common reason for African American juveniles to be arrested in 2010, at 17.2 percent, which exceeded disorderly conduct by 1 percentage point. The third most common crime among blacks was shoplifting at 14 percent. The top three reasons for Latino juvenile arrests were disorderly conduct at 15.3 percent, shoplifting at 13.5 percent, and simple assault at 9.8 percent. 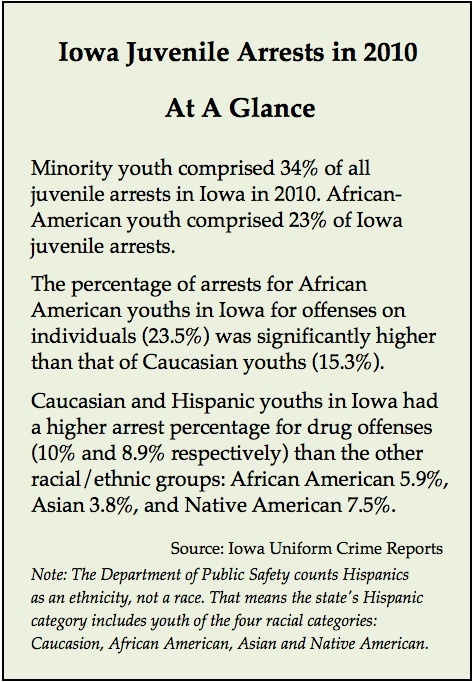 Twelve percent of Caucasian juvenile arrests were for shoplifting, 11.2 percent for simple assault and 10 percent for liquor law violations in 2010, according to the report, issued last year by the Iowa Department of Human Rights, Division of Criminal and Juvenile Justice Planning and Iowa’s Juvenile Justice Advisory Council. Virgil Gooding, a therapist at Keys to Awareness in Cedar Rapids, said data like that counter the stereotype of young blacks who get in trouble with the law consistently being involved in violent crimes. “Even though the real reasons that these kids get arrested are the same reasons that other kids from other races get arrested why do we continue to believe that black kids get arrested for big crime and violent crime?” Gooding asked. Yet, black gangs, which draw attention because of violent crime, persist in parts of Iowa. “I think it is based on poverty and the isolation and prejudice and racism that still exists in our society,” George Boykin, executive director of Sioux City’s Sanford Community Center, said. The Sanford Center runs an outreach program that offers alternatives to gang behavior, an alternative program that helps youths continue their education while suspended from school, and after school and summer programs for elementary school children. Brantley said Iowa’s criminal justice system is too punitive and shouldn’t simply send people to jail for nonviolent offenses. Marshalltown Police Chief Michael Tupper said a detention screening tool is being tested at the state level that would assess the risk of arrestees to determine whether it would be safe to let them out on bail before their trial. An impartial tool such as this would eliminate racial bias when determining whom to detain, he said. “If they aren’t a threat to themselves or others and there’s a suitable place for them to go, they shouldn’t be detained,” said Paul Stageberg, Administrator of the Division of Criminal and Juvenile Justice Planning at the Iowa Department of Human Rights. In the early 1990s, Dave Selmon was a crack cocaine addict selling and using drugs. In 1994, Selmon was placed on probation for selling crack and cocaine. But in 1995, he was convicted of forgery, a felony. “I sold and I used and, in that process, I wrote some bad checks and that caught up with me,” he said. Selmon went to jail in 1995 for two-and-a-half years. While in jail, Selmon said, he learned how to preach and how to build a sermon. He said he wanted to be a changed person when he got out of jail. “What worked for me was realizing my life was out of control. And I cried to the Lord. And that was my answer,” he said. Today, Selmon is a pastor at City Church in Burlington. One of his duties as pastor is visiting area jails, preaching the word of God. Selmon, 56, is enrolled at Southeastern Community College in West Burlington, where he plans to get his degree in chemical dependency counseling. Even if they do not end up in the legal system, doing drugs can prevent young black men from getting a good paying job, he said. Lauren Mills of IowaWatch contributed to this report. I-News is the public service journalism arm of Rocky Mountain PBS. For more I-News stories, please go to http://www.inewsnetwork.org/. I-News and IowaWatch are members of the Investigative News Network, which includes more than 80 nonprofit news organizations. Costs and time spent defining what qualifies as an open record in Iowa are the biggest impediments to gaining access to information about how government functions and the way public money is spent. The cluster of rules defining public records in Iowa can be confusing or leave room for uncertainty. When a dispute arises, fighting for access to information can incur expensive legal fees. It’s about time this is exposed! Results? We shall see.